So what do you do when there are heavy storm clouds outside and a howling gale gusting them threateningly across the sky? Stay in the warm with a nice cup of tea? Hibernate? No, you head for the coast of course :)! And that is just what I did on this day towards the end of last year! The walk started quite straightforwardly with a gentle downhill stroll from a small village towards the coast. In fact, it wasn’t really straight forward at all because, as has been usual in Dorset over recent months, there was thick and slippery mud everywhere, not conducive to safe downhill walking. So it was out with the walking pole just to try to avoid the ‘wet, muddy bottom’ syndrome ;)! Now if I had had a pair of skis with me……..! I came out onto the coast at one of the many disused quarries that litter this stretch of Dorset and for a time the sun actually made an appearance. 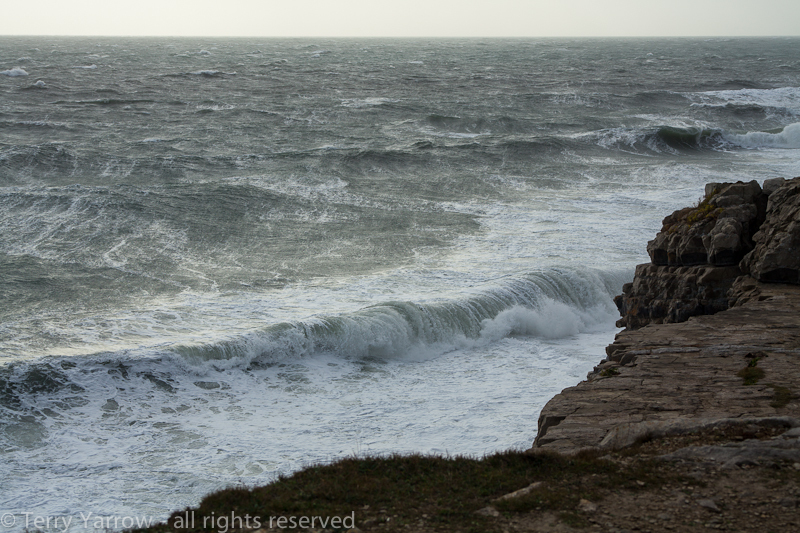 The wind was working itself up into a frenzy and the waves were powering their way to the shore, only to come to an abrupt halt on the rocks at the foot of the ledge. They almost seemed to display their annoyance at being stopped by launching themselves as high as they could into the air. 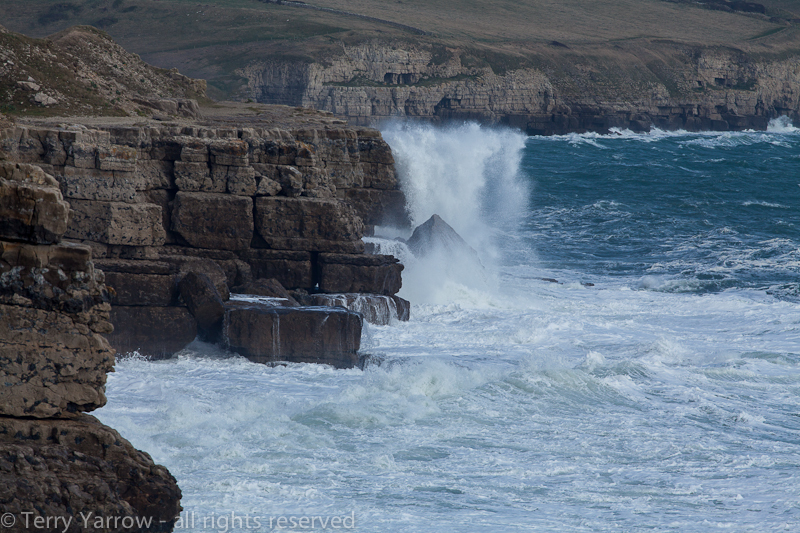 Conditions for photography were dire because the spray coming up from the rocks below was enormous – in fact it may as well have been raining! Cameras and salt sea spray do not make a good mix so the only way to get pictures was to hold the camera landward of my body to protect it, and then very quickly bring it up, grab the picture and then tuck it away again. There was no time to properly compose the shots. Very soon, the sun disappeared as the clouds continued to build ominously. Normally this would be disappointing but in fact it was perfect because it really brought out the ferocity of the stormy weather and the real ‘personality’ of this rugged coast. It is a very changeable area, seemingly incongruently tame and innocent in the sunshine but taking on a whole new sinister character as the storm rolled in. Along this part of the coast, there are many old quarry caves so I decided to take refuge in one of those and to see if I could at least find some way of getting out of the constant spray so that I could try to get some better pictures. I was carrying my tripod so I set this up in the entrance to one of the caves and stood between it and the sea so that I could protect it from the spray. 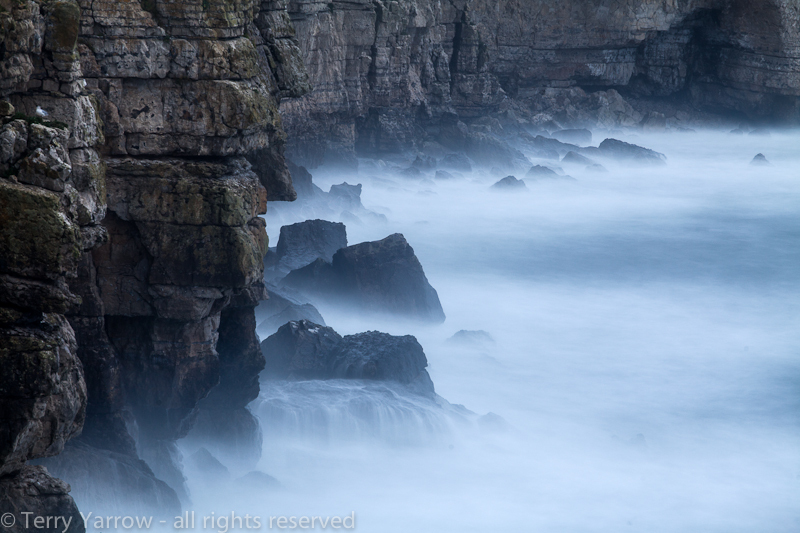 I was then able to get some long exposure shots in an attempt to convey the true power of the sea. 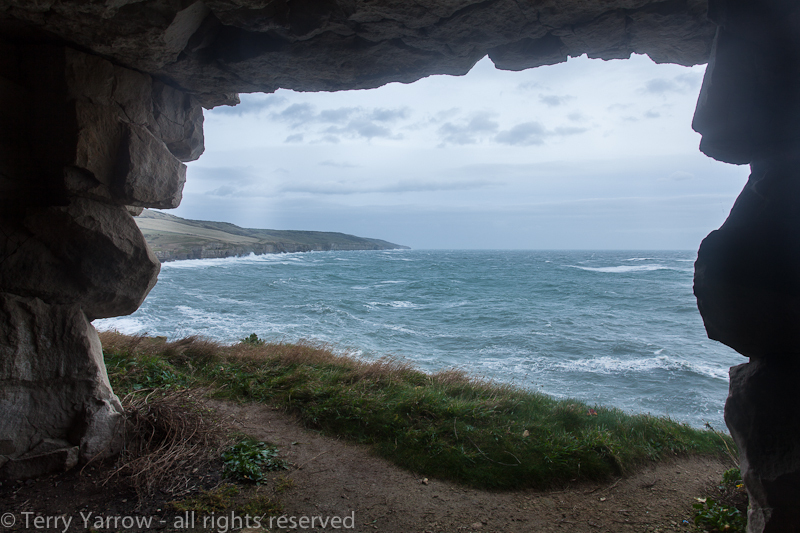 My intention was to climb from here up over St Aldhelm’s Head so I repacked my rucksack and left the safe confines of the cave and walked out again into the teeth of the storm. 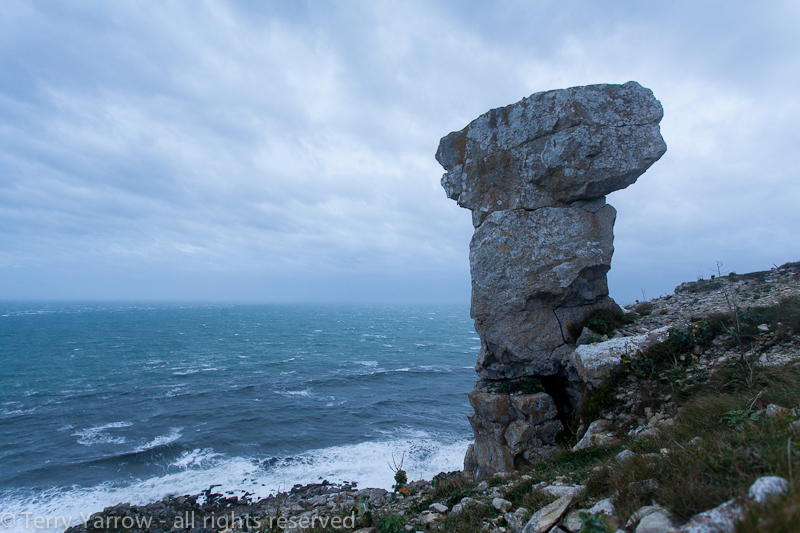 The route initially took me along the rocky ledge but all too soon I had to leave that solid ground and venture onto the very muddy footpath that climbs steadily upwards towards the top of the headland some 350 feet above the sea. Any of my local readers will know that this mud is SLIPPERY and CLINGY so that your feet become heavier and heavier as you walk. 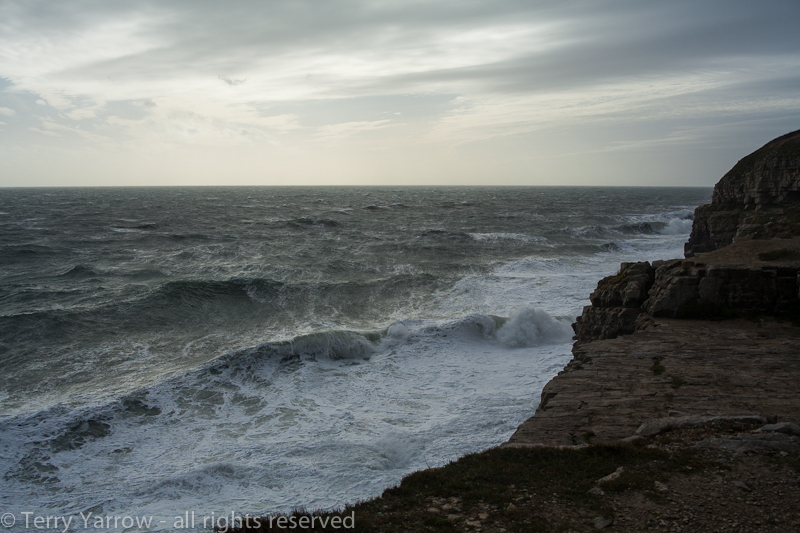 With the combination of the ever steepening path, the slippery mud, the sea spray, and the howling gale that was gusting powerfully off the sea, this was one challenging walk………and it was GREAT :)!! The expression ‘blow the cobwebs away’ comes to mind. It was only later that I learned just how strong the wind was! There was one particular incident that was funny…….and you will need to use your imagination here. As I was slip sliding up the hill, my hat blew off over a barbed wire fence and started bowling its way at a rate of knots across the field. Now this was a hat that was bought for me by my daughter so I was rather attached to it (although thinking about it, maybe it would have been better if I had been literally attached to it ;)! ) and I wasn’t about to let it go. So I climbed the barbed wire fence, tearing my waterproofs in the process, and complete with heavy backpack ran after it – hopefully you can picture the scene :). I managed to catch up with it eventually and stowed it safely away before climbing back over the fence onto the coast path to continue my upward journey. I must have made a strange sight as it was impossible to walk in a straight line as I was buffeted and slipped all over the place. In addition, to try to stay upright, I had to lean into the wind which then made a fool of me by momentarily dropping so that I nearly fell over. It was a miracle that I kept my feet but to anyone looking on it must have looked like I was a drunken man! At times, it was even difficult to move at all! Eventually the path levelled out as I reached the quarry ledge just below the top of the headland. This ledge has a lot of history with the remains of a once thriving quarrying industry, and also the remains of a Second World War Radar Research Post but I think that will need a separate blog entry to detail. 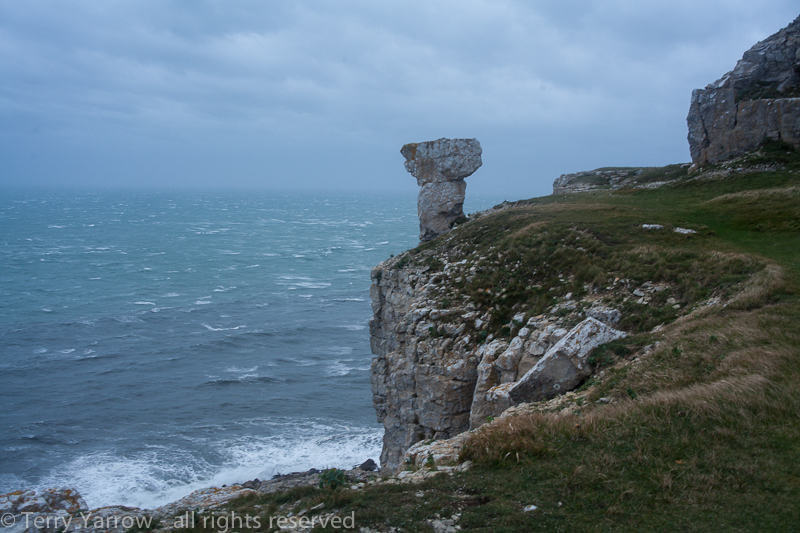 The remains include what I call ‘The Chimney’, a stack of stones left by the quarrymen when the work ceased – oh how I wish the picture could convey to you the strength of the wind gusting across that ledge. Sadly, this is where a picture fails. 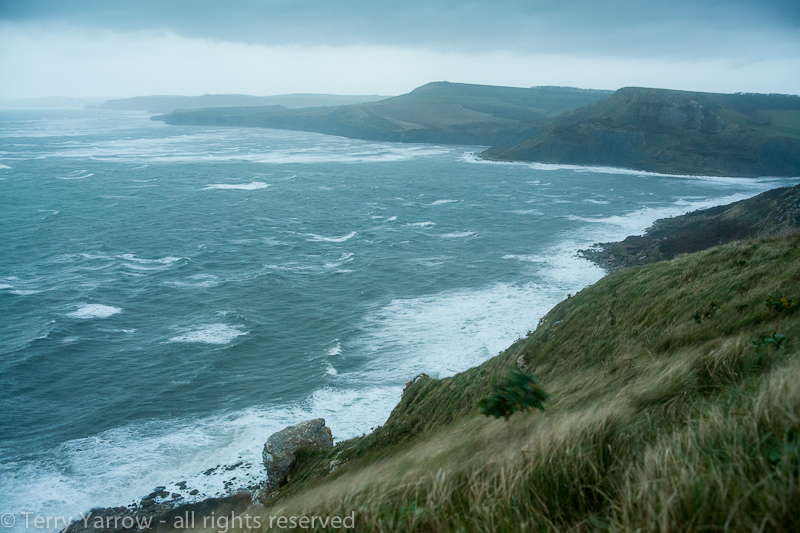 One of the quirky things about St Aldhelm’s Head is the effect on the sea and the many white horses that are seen here. These are apparently caused by the fact that there is a ledge some 30 feet below the surface that stretches several miles out to sea. It makes these waters quite dangerous and because of that, there is a National Coastwatch Lookout Post on the headland. 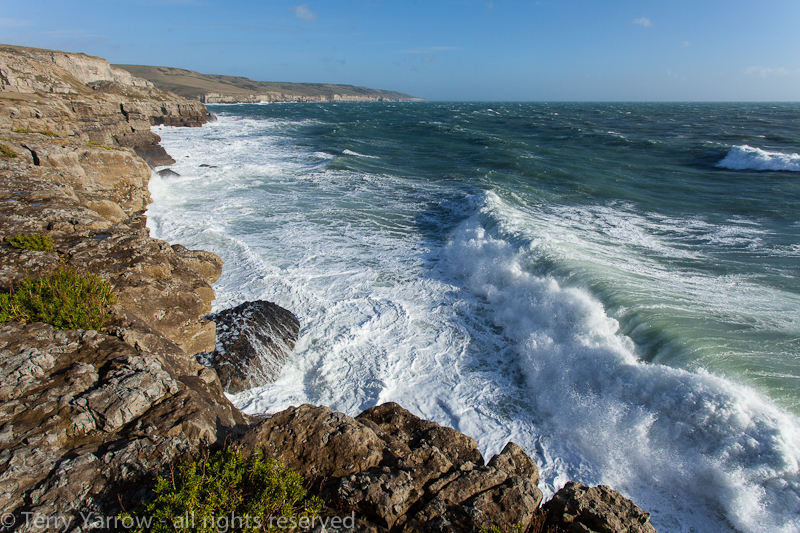 From the quarry ledge, it is only a short hop up to the top of the headland……..but I think I gave the National Coastwatch Volunteers a bit of a shock when I climbed up the cliff beside their lookout post, they hadn’t expected to see anyone on a day like this! I went into the lookout post for a few minutes to chat to the ‘Coastguards’ and the calmness and peace inside was tangible…..and a welcome respite! Being wet and muddy, I dared not venture too far in though! The volunteers had just been carrying out a reading of the wind speed and they told me that it was a Force 9 gale – OK, so a slight breeze ;), no wonder my hair was blowing about!! The light was fading so I couldn’t stay long before I headed out into the wind again to take a last look west along the coast. 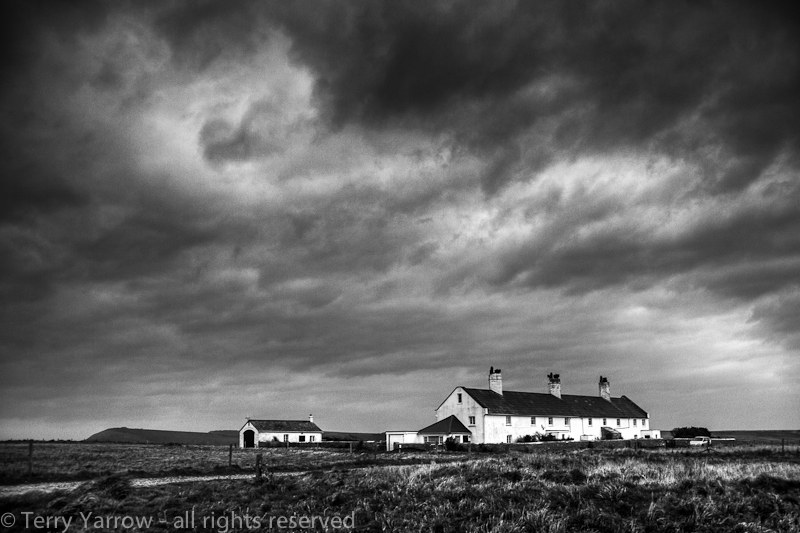 As I turned away from the coast to start my walk inland, I passed the row of old coastguard cottages that stand proud on the headland. These once housed the officer and men with their families but are now in private ownership, mostly as holiday accommodation – and what a great place to stay! With the heavy storm clouds above, I couldn’t resist taking one more picture. 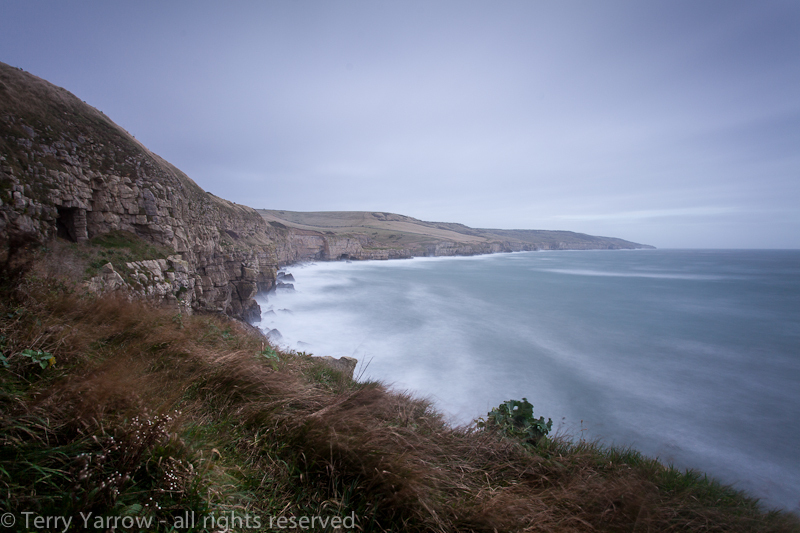 It was an interesting experiment in how to hold a camera steady in the failing light with a Force 9 gale blowing!! I could have used the tripod but that wouldn’t have stood a chance – well just ‘wouldn’t have stood’!! As it was, I just crouched as low as possible and anchored myself as best I could. And so, finally I made my way along the rough track that would take me back to my starting point. As I walked, the Coastwatch volunteers passed me by in their 4X4 and stopped to offer me a lift to get me out of the wind – I thanked them but refused. Well the wind may have been battering me all day and I might have been soaked with all the spray but I was enjoying my ‘walk’ far too much and I didn’t want it to end. Thanks for stopping by and reading the ramblings of The Dorset Rambler. Previous The old and the new – year that is! Oh, Terry!!!! Without question, this is one of your best yet! I absolutely love these pictures. They are so very good. I especially like the first one and the ones titled “Angry Waves” and “Stormy Seas.” And, of course the last one of the Coastguard cottages. It’s just magnificent. I could definitely feel the power of the storm and the sea in all of them. And you, most definitely, fit the definition of a “true artist.” When one is blessed with that special something that makes him a true artist, he has a unique kind of drive in his soul that leads him into paths normal/ordinary people would never dare to trod. It seems to me you live the majority of your life that way. Congratulations! I have a question about the “white horses.” I’m assuming it refers to the white caps on the waves somehow, but I’m wondering why the term “horses” is applied rather than something else. Thanks so much Sandra, you are very kind and your comments always encourage me. I’m not sure where the term ‘white horses’ comes from but I guess it is because as the waves move along, they look like galloping white horses. I’ve always known them by that name. Bless you Sandra. 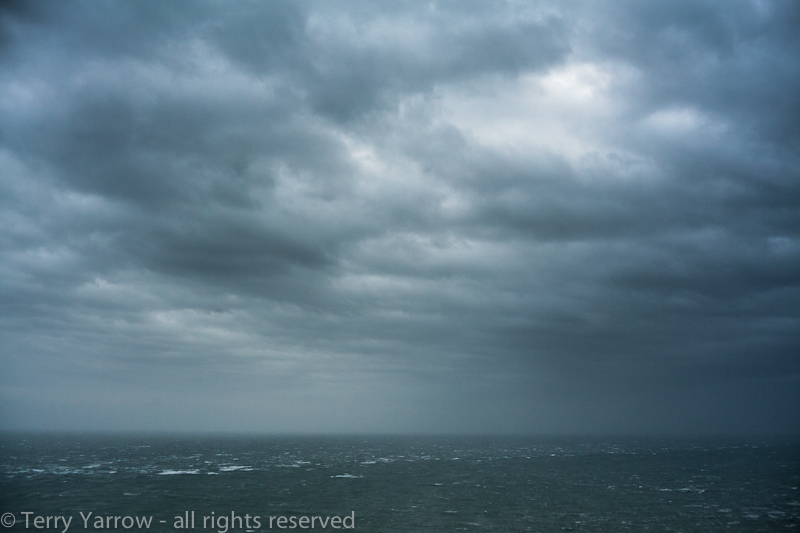 Yep–your gales are like our prairie winds (I had to look up the conversion to miles per hour for us land lubbers). But I love wind too! Your area is more picturesque–mostly tumble weeds and grit and limbs blowing here. Thanks Alice 🙂 I bet tumble weed is beautiful to see as well. I love tumbleweeds–although they can be scary on the highways–and pile up in drifts against fences. What a ‘fun’ walk you had Terry, not one to turn away from the forces of nature are you? Sounds like a fun walk, using the word ‘fun’ in the loosest sense, not sure I would have fancied that. So far I have done walks the last 2 Saturdays but only 4-5 miles so far, maybe you could inspire me to go further. I particularly love the ‘Stormy Seas’ photo. Thanks Andy 🙂 Keep up the walking.